How To Crash Friends Whatsapp Account Just By Sending Message? This is the question every pranky man or kid wants to know. And I’m sure you are one of them. So if you are also searching for this how to crash someones whatsapp account then you are at perfect place because today I will share the latest and effectively working trick to crash your friend’s Whatsapp account. Otherwise if you are searching for this question How to crash whatsapp group? Then don’t be sad because with this trick you can also crash whatsapp group easily. There are lots of whatsapp hacks or Facebook hacks available on internet like how to use Multiple WhatsApp Account in one Phone etc which will make your days awesome and make your laugh like hell. Nowadays almost everyone who is connected to social media is using whatsapp for sure. Whatsapp is the best and safest way to chat with our friends, relatives, loved one’s or anybody out there in the world. Teachy people keeps creating new tricks or hacks for whatsapp so that people can use it for their fun because at last everyone wants fun and fun. There are two ways with which you can crash friends Whastapp account just by sending messages. One method will need a computer/laptop and other method will work on phone. But the phone method doesn’t works everywhere it may not work at your location so I suggest you to try the computer method. Don’t be sad you should give a try to phone method first. So let’s see how to hang friends Whatsapp account within 2 minutes. This is the trick basically named as whatsapp emoji bomb which is answer to your today’s question how to hang friends Whatsapp account. You just have to download a small app to crash someones whatsapp account. 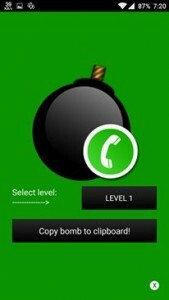 Step 1- Download Whatsapp Bomber apk (You can directly download the apk by clicking on Whatsapp Bomber apk). Step 2- Now install the downloaded app and run/open it. Step 3- Now at home screen of this app you will see five levels. Basically this level denotes the harmfulness of the whatsapp crash. The level one is the basic small crash and the level five is the powerful crash. So I suggest you to first go with the level two or may be three because with this you will get to know that how it works. 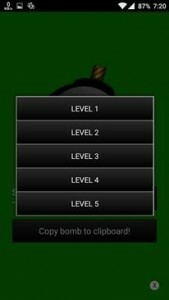 Step 4- Now once you have clicked on any level then just click on the button “Copy bomb to clipboard”. This copied text is also known as phone hang hua whatsapp message. Step 5- Now just open your whatsapp and send this copied text to anyone whom whatsapp you want to crash. So that’s all now once he or she opens your message and when they will open it then boom their whatsapp is crashed or hanged. So I hope this trick works fine with your phone and gives you answer of your above question or how to crash anyone's whatsapp. Don’t think that this will be lengthy or tough method because most of people think that oh this method needs a computer so it must me more tedious or hard. Trust me it will also take your maximum two minutes. You just have to download a simple tool, don’t worry it will be of maximum 5mb. So let’s directly see how to crash a whatsapp account with the help of PC. Just follow the below give steps one by one to crash whatsapp by sending message or crash whatsapp by sending a contact. Step 1- First of all download the tool to crash whatsapp with a message (download from below button). Step 2- Now just simple install the downloaded exe file of tool by double clicking on it (don’t forget to allow unknown sources in your phone’s settings). Step 3- Once you have installed the tool successfully run it or open it. The home screen may looks little bit scary but don’t worry it will not harm your computer and not even harm your friends phone internally. It’s just a prank. Step 4-There you will see a box on which you can type anything. So just type the message you want to send to your friend. You can type anything like Hey this is a prank don’t be mad etc. 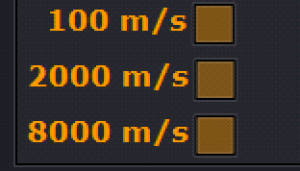 Step 5- Now below the text area you will see few options like 100m/s or 2000m/s this is not 100 meter per second for sure Lol, this is 100 message per second. Means this tool will send 100 or 2000 message to your friend per second. Just choose any speed but again I recommend you to choose the medium one for the first time. Step 6- Now you have to open whatsapp on your computer, just go to this website https://web.whatsapp.com/ and just scan your whatsapp QR code then you will be logged in to your whatsapp account (if you don't know how to use whatsapp on PC then read our step by step guide How To Use Whatsapp On Your Pc Or Mac (Step By Step Guide)). Step 7- Once you have opened your whatsapp account then just select any ones profile or chat with which you want to do this prank. Step 8- Now click on the start button on the tool. Step 9- Now just click on the “type a message box” in whatsapp chat. That’s all now you will see that you have sent thousands of messages automatically to your friend. This will crash your friends whatsapp for sure. With this awesome tool you can crash anyone’s Whatsapp account.And I'm pretty much sure you have got your answer of your question above. -> Some point’s you have to take care so that you can protect your phone otherwise your phone can also hang for a while. Go to your whatsapp and clear the chat of that friend with whom you have done this prack to crash your friend’s Whatsapp account. Plus I suggest you to not try this trick if your phone has ram less then 1Gb. 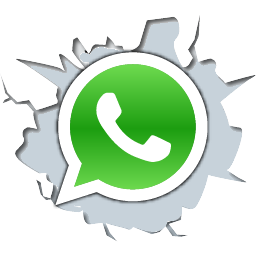 Now How to make your whatsapp again workable or just like before after crash someones whatsapp account? So now that you have successfully Crash Someones Whatsapp Account now it’s time to tell them how they can recover their whatsapp. Most probably you have done prank this with your friend so they will definitely tell you to make it as before you must know how to recover whatsapp account after bombing. Step 1- First of all head over to your phone’s setting. Step 2- Then tap on Settings option. Step 3- Now Search for whatsapp there and then click on it. Step 4- Now You will see two options there Force stop and Uninstall. Just click on ‘Fore Stop’ option. Don’t open any chat during these steps. Step 5- Now Open up your whatsapp and delete your chats or we can say clear whatsapp chat history. That’s all now your friend can use his or her normally just like before. So now you know all about how to crash whatsapp by sending message. Don’t forget to share this awesome trick to learn how to crash a whatsapp account or how to crash a whatsapp group with your friends.